This past Sunday marked the tenth anniversary of a day that changed the world and has come to define an era. Unless you were miles away from a television set (or other people), you will most likely remember exactly what you were doing the moment the news reached you that the United States had been the target of a terrorist attack of unprecedented scale. This may seem like the strange topic for a post on a site about comics, but not only do I personally feel that it’s important to say something about it, but the event was significant enough to make it into comic book lore, as evidenced by the page below. While hijacked planes also crashed into the Pentagon in Washington D.C. and a field outside Shanksville, Pennsylvania, the 9/11 attacks have also come time be intimately associated with New York City as a stunned world watched the two towers of the World Trade Center collapse. Generally speaking, I’m not a big fan of overtly referencing current events in comics (current issues that aren’t tied to a specific date or just staying with the times are a different matter). 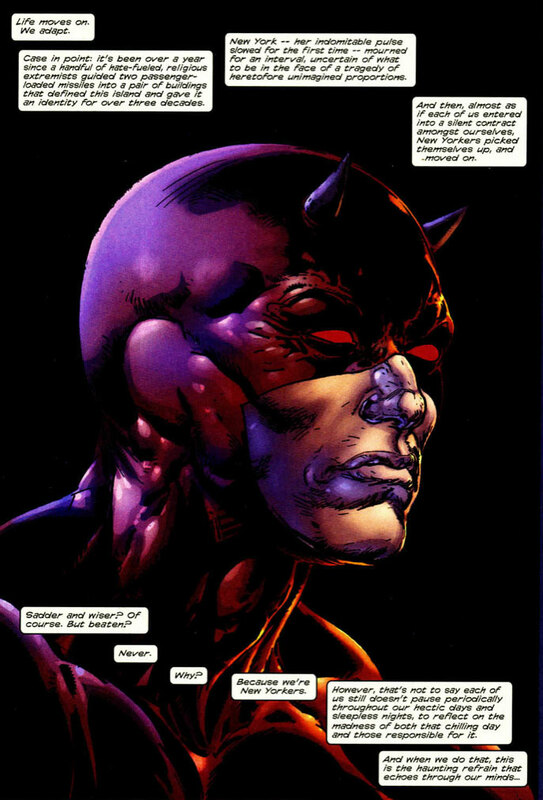 However, I have to say that the first page from the ill-fated Daredevil/Bullseye: The Target #1 by Kevin Smith and Glenn Fabry makes for perfect Daredevil-related reading as we remember that fateful day. “Life moves on, We adapt. Case in point: it’s been over a year since a handful of hate-fueled, religious extremists guided two passenger-loaded missiles into a pair of buildings that defined this island and gave it an identity for over three decades. New York — her indomitable pulse slowed for the first time — mourned for an interval, uncertain of what to be in the face of a tragedy of heretofore unimagined proportions. And then, almost as if each of us entered into a silent contract amongst outselves, New Yorkers picked themselves up, and moved on. Sadder and wiser? Of course. But beaten? Never. Why? Because we’re New Yorkers. In much more positive news, Daredevil #3 and New Avengers #16 will be out tomorrow. I will see you again when it’s time for reviews! We also learned via Daredevil director David Slade that the script for the movie is still a work in progress and that no news on casting or anything else will be forthcoming until they’re good and ready. Probably a good idea.